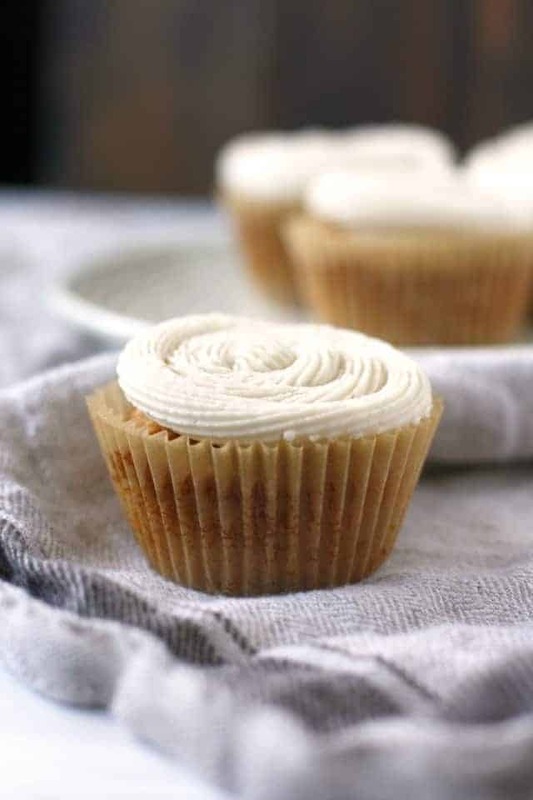 Home » Desserts » Vegan Vanilla Cupcakes with Buttercream Frosting. Vegan vanilla cupcakes with buttercream frosting are perfect for a party! Yes, you can enjoy fluffy, tender cupcakes even without dairy and eggs! Cupcakes…do you even need a reason to make them? Any day is cupcake day! Anyway, I made vegan vanilla cupcakes the other day, and they were a big hit. We had friends over for dinner, and I thought cupcakes would be a good way to end the evening. Not everyone loves chocolate (I know, what?!?) so I went with a simple vanilla cake and a creamy, buttery frosting. Before I had to eliminate eggs from our diet, I would have had a hard time believing you could make a good vanilla cake without eggs. But these vegan vanilla cupcakes are everything they should be: fluffy, sweet, tender, and with just the right amount of vanilla flavor. If you’re new to baking without eggs or dairy, this is a great recipe to start with. It requires simple ingredients, and the result is excellent. These are practically foolproof! Can cupcakes rise without eggs? Yes, they can! These cupcakes rise very nicely due to the chemical reaction from baking soda and vinegar. This results in a very light, fluffy cupcake. 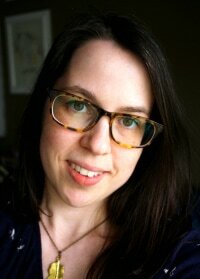 Read my post on egg replacers to find out more about vegan baking. Can I make vegan cupcakes with coconut oil? Yes, if you prefer to use coconut oil, you can do so. If you use unrefined coconut oil, these cupcakes will have a coconut flavor. 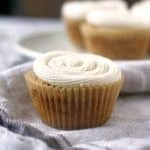 Can these vegan vanilla cupcakes be made in advance? Yes, you can make these cupcakes one day ahead of time. Just make sure they are tightly wrapped so they don’t dry out. Can these vegan cupcakes be frozen? Yes, they can be frozen with or without the frosting! Just store them in a freezer bag or airtight container. They should be fine in the freezer for up to 3 months. 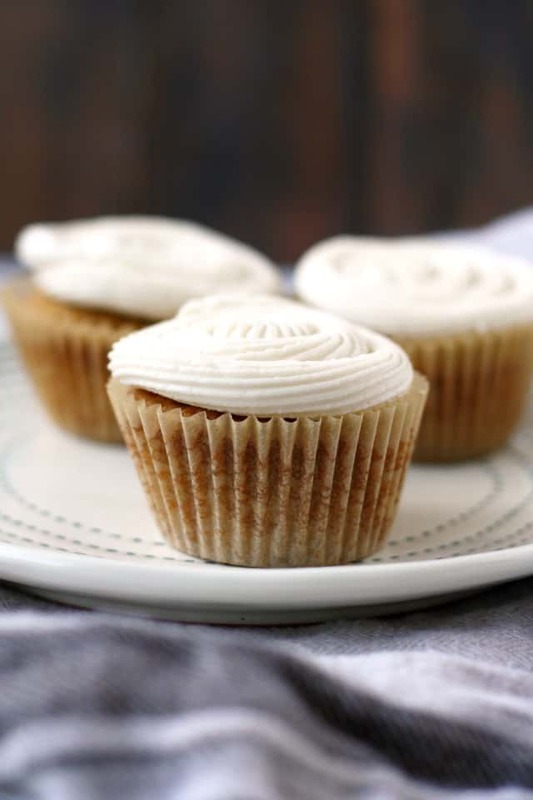 If you’re planning a birthday party or bake sale, these vegan vanilla cupcakes are sure to be a hit. They hold up well, and taste just like “regular” cupcakes. No one will guess that these are completely plant-based! Vegan Vanilla Cupcakes with Vanilla Frosting. 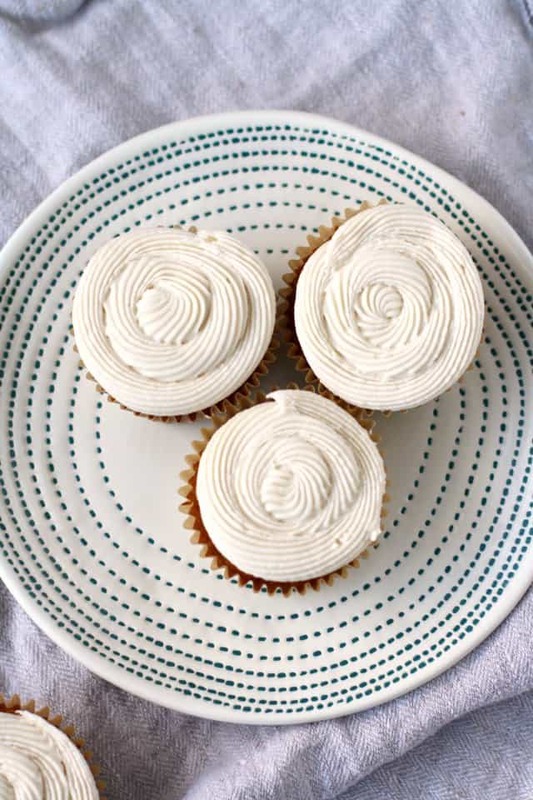 These vegan vanilla cupcakes are topped with creamy frosting and are a perfect treat for a party! Everyone loves this moist and tender cupcakes. Preheat oven to 375 degrees. Place cupcake liners in a muffin pan. Put the dry ingredients in a bowl, and whisk with a fork. Add the wet ingredients and beat on medium speed. Bake for about 20-25 minutes, until cupcakes are nicely golden on top. Make the frosting: Whip the vegan buttery spread on medium speed. Add the powdered sugar and one tablespoon of coconut milk and continue to mix. If the frosting is too thick, add a little bit more coconut milk until a spreadable consistency is achieved. These cupcakes should stay fresh in an airtight container for 3 days. You can use coconut oil if you wish, but they will have a coconut flavor if you do that. 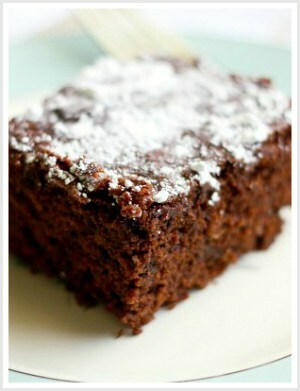 Top these with chocolate or vanilla frosting, or just give them a dusting of powdered sugar! Nutrition facts are for one cupcake. What’s your favorite kind of cupcake? If you’re more of a chocolate person, try these vegan chocolate cupcakes. This post was originally published in May 2014. It has been updated. « Super Simple Vegan Tortilla Soup. 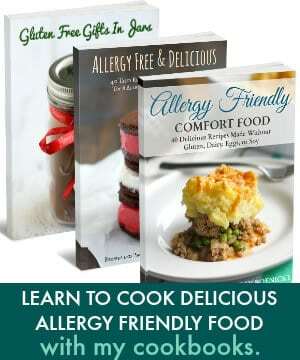 Could you use a 1:1 gluten free flour instead of spelt or all-purpose? These tasted great!I’m not sure if I over cooked them,or should have taken them out of the pan to cool, because they stuck to the cupcake liner? Did you use parchment paper liners? I find that sometimes regular liners are a little sticky. I never need a reason to make cupcakes! These look incredible. I’ve have yet to make frosting with a vegan spread, but I think I should, because it looks scrumptious! I love the sugary crust that frosting gets when it hardens. Hope that isn’t weird :) hehe. These cupcakes look so simplistic and classic, Kelly! I love a good vanilla cupcake with classic buttercream. One of my biggest weaknesses! And so perfect for Memorial Day weekend. Pinned! Thanks so much for pinning, Sarah! Have a great holiday weekend! I don’t descriminate against cupcakes — can I say alllll cupcakes are my favorite cupcake? These look delicious. I actually have a cousin who (despite loving chocolate) hates chocolate cake, so it’s great to have nice vanilla cupcakes in my arsenal. Thank you so much! I know, my two year old doesn’t like chocolate cake, so having a good vanilla cake recipe is a must over here! I don’t know where he got his non chocolate loving genes from! ;) Not from me! I need to try these cupcakes for a friend of mine who is vegan. I love how they don’t use any crazy ingredients I don’t already have in my pantry. Do you think they would work with all purpose flour? Yes, all purpose flour will work just fine! There’s nothing better than a moist, simple vanilla cupcake! These look 1) so delicious and 2) so beautiful. I love those little sprinkles and that beautiful buttercream. The pastels remind me so much of Magnolia Bakery! Nope, no reason to whip up a perfect cupcake needed! I could go for these no matter what season we’re happen to be in :). They look so yummy! 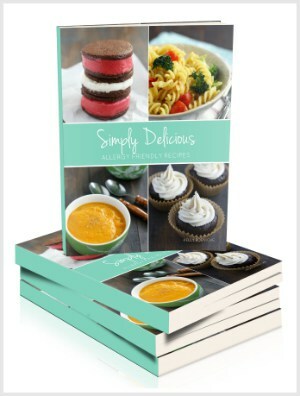 No excuses needed to make some delicious cupcakes! Love those cute sprinkles on top. These look deeee-lish!